But what if migrating at certain times of the year was necessary for our survival, as is the case in the animal kingdom? Imagine coordinating an epic journey over weeks or even months, crossing multiple borders or oceans in order to breed, find food, or escape seasonal changes. From worms, crabs, locusts, and fruit bats to American buffalo, African elephants and manatees, animals are doing just that in nearly every corner of the globe: migrating by land, water, or air for survival. For many of us, these daring journeys are often a spectacle. For example, in Canada, the porcupine caribou (popularly known as reindeer) undergoes the longest one-way journey of any land animal, crossing 1300 km from northeastern Alaska across the increasingly populated stretch from the northern Yukon to the Mackenzie Delta in the Northwest Territories. And in vast herds, the African wildebeest migrate clockwise across the Tanzanian Serengeti, some 2880 km. The thought is enough to make one’s feet throb. Here at home, bar-tailed godwits endure the longest known non-stop trip from Alaska to New Zealand in order to feed on our molluscs, crabs, and marine insects. I can think of two important reasons why animal migration is important to humans: they play an important role in ecosystems on which we rely, and they lend a better understanding of the natural world around us (how they navigate, how they adapt for migration, types of migration, and changes in our environment). However recent studies have shown that migration is increasingly endangered amidst the recent heady heights of human resource consumption. I wonder just how much our focus on robust economic and human expansion, with no end in sight, is affecting the survival of migrating animals. In 2007, environment correspondent, Alister Doyle reported that migrating animals are more vulnerable than non-migrating species because of the distances they travel. And the single largest contributor to disrupted migration patterns is the effect of global warming. Human activities such as deforestation, pollution, mining, and population growth contribute to a significant overall rise in temperature that devastates migratory routes and habitats. For instance, shrinking polar caps force aquatic mammals into alternative migratory paths where they have to compete for food. The wildebeest, who time their migration according to seasonal rains, are threatened by decreases in rain as well as land en route being converted to farms and villages. 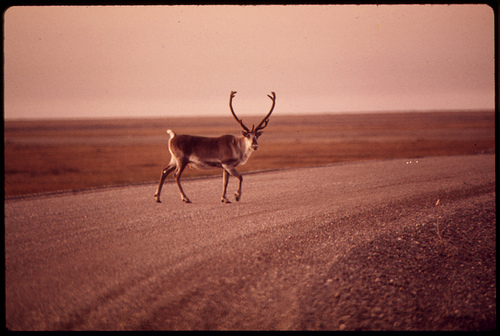 On the caribou migratory path, oil exploration and road construction have impacted the ecosystems in the Northern Canadian Territories recently prompting a sharp decline in the numbers migrating. These reindeer may eventually be confined to cute Christmas cards. The godwits also experience the effects of human activity across the Asia-Pacific. On their north bound journey to Alaska, the flock use the tidal flats of the Yellow Sea region to refuel. These tidal flats have recently been subject to reclamation projects and an increase in pollution. In New Zealand recent coastal farming practices have caused an unnatural expansion in mangroves leading to habitat loss. And scientists suspect that the long-term shifts in weather patterns caused by climate change may impact the favourable winds required for migration – the bar-tailed godwits must be at their …wit’s end. If we pause to consider the international flight of the bar-tailed godwit for a moment more, we realise that any real mitigation of human induced threats must be a matter for international law as well as domestic law. Trouble is, because international law is usually a series of agreements between sovereign States entered into for their mutual benefit, the authority of that law depends upon voluntary participation of states. Because of the sovereignty doctrine, international law has often been criticised as a failing global system of justice. It is a contentious subject in the legal world. Should the doctrine of sovereignty be an excuse for gross violations of our environment and the animal habitats it supports? Personally I am optimistic that international agreements can and do have influence in the enforcement of norms, even if I admit that a state may become signatories purely for reputation in international trade. The international law regulating migratory species is in reasonably good shape. In 1979, the United Nations Environmental Program (UNEP) recognised the human induced threat on marine, terrestrial (land), and avian migratory species and drafted the Bonn Convention. This agreement highlights the need for cooperation to conserve animals that migrate across national boundaries and between national territorial waters. In 1999, New Zealand signed the Convention and, as at February 1 2010, has specifically agreed to conserve the petrel and albatross and signed a Memorandum of Understanding that the migratory corridors of all cetaceans (whales, dolphins, and porpoises) must be protected from human pollution, climate change, and resulting loss of habitat. The protection of migrating species should be important to us because of the interdependence of the planet’s entire life cycle; depleted rates of animal migration ought to sound an alarm that the well-being of the planet is dangerously jeopardised. Climate change affects us all, yet the difference is that migrating animals can do nothing about it, whereas humans can. As I see it, the threat to migratory animals is litmus that robust economic and human expansion has gone too far. If we do not have greater concern for the environment and the impact we are making on migratory animals, I wonder whether one day, all humans will be bound to the fate of annual migration.